On a very cold winter Tuesday I was on the way to enjoy an occult Swedish evening organized by King Foo Entertainment: Watain and In Solitude were playing at Nosturi. The evening I had looked forward to started off badly as I missed the tram by half a minute and standing around in -20°C, waiting for the next one worrying if I would be late for the first songs of In Solitude was not how you get into concert mood. But I was in luck and the band was also 10 minutes late which left me the perfect amount of time to get inside as there was no queue, grab my press pass (yay to King Foo Entertainment for not only giving the photographers press passes but also the writers which is a rare thing – I am a sucker for such memory pieces!) and a drink before Pelle &Co. got on stage. A small but decent crowd had made its way to Nosturi – decent for a Tuesday evening at least with tickets that had been fairly priced at 26€. 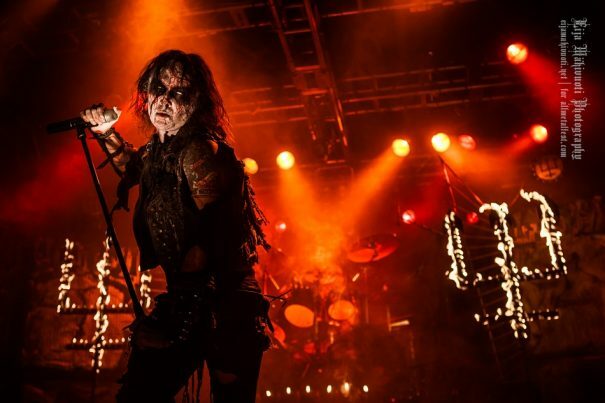 Upon entering the concert hall the smell of incents was intense and In Solitude’s drum kit looked like it would be swallowed up by Watain’s set up behind it – there was not too much space left with all of Watain’s gear and decorations but In Solitude made it work. 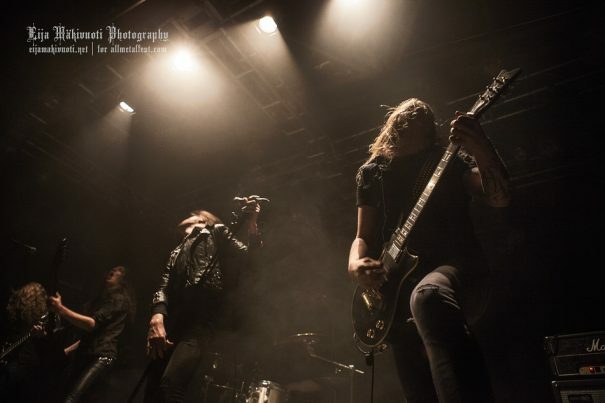 Pelle got on stage with a good rock star attitude – from the black leather jacket to the typical movements he had it all – and it seemed promising for the show to come. Only a small crowd had gathered right in front of the stage while most watched from a far in the beer area and more returned back there as at the beginning the sound was not very balanced. 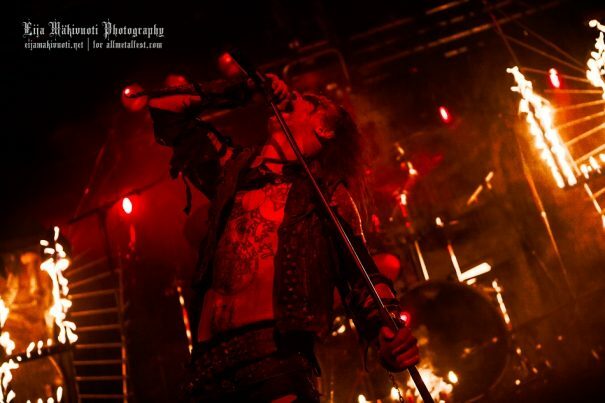 Also, it was clear that Watain was the main act everyone was waiting for. But In Solitude did their thing – they were head banging from the get go, the stage was bathed in red and white back lights so one could only see their dark silhouettes and with all of them dressed in simple black clothes and Pelle’s uncanny front man ability to hide his face while head banging and singing the set had a nice aesthetic and atmosphere. This goes to show once again that with simple elements a band can create a great and consistent aesthetic which makes it even less understandable for me if they don’t even consider the whole aesthetic side of a performance. Luckily the sound also got better during the gig – doing the music, the guitar melodies and Pelle’s voice justice. There suddenly was groove! The crowd also appreciated this and hair was flying in the front row. Especially “Sister”, a new song from their latest album of the same name showed off their skills – the performance and music were dynamic, Pelle’s voice had a warm, fascinating dark depth that lured you into the song and his performance was just enough to make it interesting without overpowering the music. Especially the bass line in “Sister” added to the song’s character and started warming up this cold winter night. Another highlight of their set was “To her Darkness” – the band was into it and it seemed the longer they played, the better they got. Things were coming together and when Pelle was singing “I am ready, I am hers now” it was hard to escape the song and the moment. Pelle created additional dynamics with the varied volume and intensity of his vocals which made the song and lyrics come to life – his voice has roots and air, it reaches deep and takes you high. It was a shame that the sound and the band were not as in sync from the beginning as they were in that moment as it would have been great to see that. But I was glad to at least for a few songs glimpse this level of performance and the people moving to the front again were proof that this seemed a shared experience. With “A buried sun” things got a bit more psychedelic and the slightly atonal qualities of the song worked well as the sound was now good enough to carry these nuances while the song was still working as one vibrant entity from the more mellow, calm parts only to spill over into Nosturi full force. Overall a good warm-up that made me hope to see In Solitude soon again with a performance where everything comes together from the start. Before Watain were set to go on stage, the area in front filled up. People were taking pictures of the stage decorations that ranged from inverted crosses and tridents to what looked like parchment or leather with collages of animal bones and skulls on them and an onstage altar that contained several jars with what I would guess were blood and incense, a goat skull, seven later lit black candles and six red ones that remained unlit. So far so good as also no bad smell could be detected like in previous gigs when they used rotten instead of fresh blood whose stench carried far back in venues bigger than Nosturi. 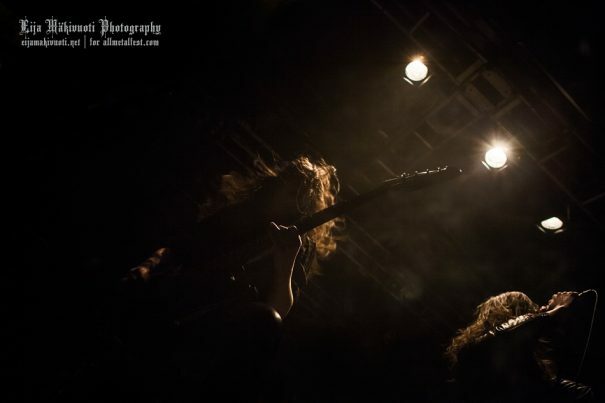 The excitement of the crowd could be felt when “Night Vision” started and as Erik and the others entered the stage the horned hands shot in the air immediately. 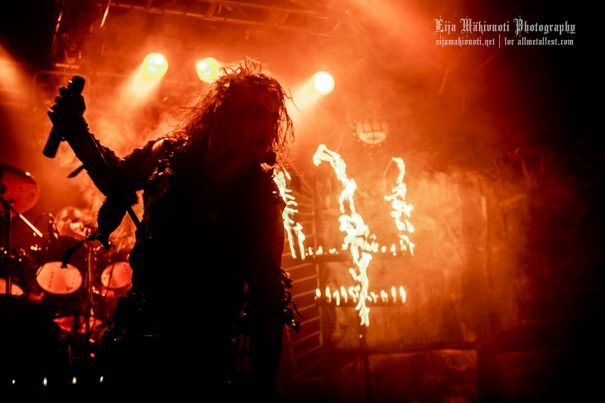 Erik started things off by lighting the crosses with a torch, commencing the live ritual by opening the circle and proceeding the ceremony with a moment at the altar showing off the back of his vest that was decorated with what looked like a dead bird. The audience was immediately into it -head banging and going with the music. The band was matching them flying hair by flying hair with Erik doing his thing of getting completely absorbed into the music, eyes closed or all white and shaking as if in trance or having a seizure. The first songs went by in a fast fury of khaos. In order to light things up for the “tired bunch of Finns” to quote Erik, he continued to light the tridents, raising the temperature in Nosturi to a hellish blaze just suitable for “Black Flames March” that created a slower, denser and maybe even darker atmosphere which I think the gig did not have enough of overall up to that point. It seems the tired Finns felt the heat as suddenly a bunch of shirtless guys was returning from the front row to probably cool themselves down with a beer which certainly was a good idea as Erik was not done with setting fire to stuff – there were still some braziers to be lit for the next songs that again took the audience on a hellish musical whirlwind only to allow for a breather with “The Wild Hunt”. The slow start, choirs and whispers went deep – one of these moments when you feel the music inside you and it allowed you to immerse yourself into the obscure atmosphere and linger there for a moment without being pressed to hurry on to the next chord. It seemed also the band needed a quick breather as they disappeared for a little while only to be back to perform “Outlaw” during which Erik channeled his painter talents and went on to draw occult symbols on the leather-skull-and-bones-collages with a what looked like a brush made out of a goat horn and what I assume was blood as paint. 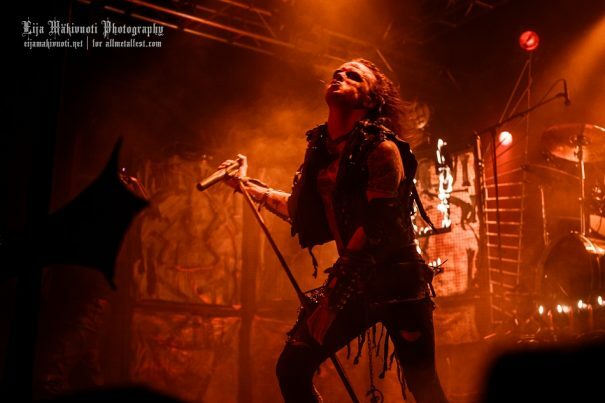 “Sworn to the Dark” conjured up energy both on and offstage and its combination of fast khaotic and driven dynamic parts made this the perfect song to reunite audience and band again after the set had lasted already for over 60 minutes and had had some lengths. 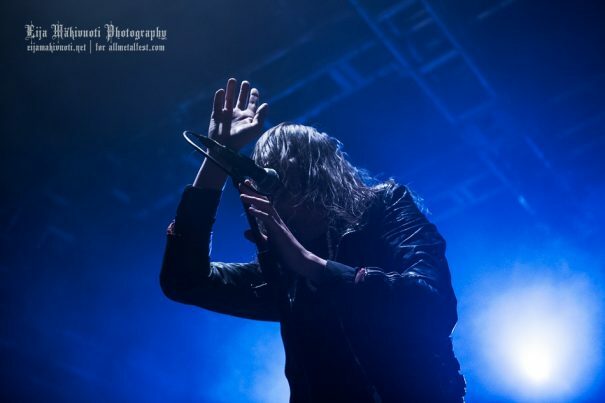 After another offstage breather for the band and frantic clapping by the audience they returned for final encores with “Holocaust Dawn” during which Erik looked almost vulnerable on stage throughout the quiet parts before convulsing into spasms again. He was clearly the ceremony master for the whole gig as while the others gave it their all playing, they held back with their presences so Erik would draw everyone’s focus and let themselves be guided into his ritual. After 90 minutes, “Waters of Ain” was to be the final song of the night and it was a worthy ending with the whole band going full force until the last moment. Once the last notes had been played Erik proceeded to close the circle and end the ritual, kneeling before the altar, incense in hand. I know that nowadays everything is photographed and at gigs you see more screens than hands in the air and, yes, I take pictures too but for some reason when many in the audience started photographing this moment it just felt wrong. It seemed so private like it should have taken place behind closed curtains, but I guess as it was a shared ritual so to speak that began with the audience in public it was also supposed to end in the same way. Before Erik left the stage for good he faced the audience one last time to express his thanks to the crowd in the form of a bow marking the final ending point of the performance. The curtains stayed open while the outro was playing and surprisingly people were not hurrying to the coat check to catch the bus home to be in bed early enough to wake up in time for another work day but they kept standing in front of the stage, listening to the outro, no willing to return to reality yet. Once the outro ended they were clapping – something I have not often seen in Finland or in general. It had been a good gig even if was on the tame side for Watain. It had had its theatrical elements as usual and it is an individual choice whether this tickles your fancy or not. But if you go to a Watain show you know what to expect so while some moments certainly can be looked upon from a comical perspective, to best enjoy and appreciate such performances is to take them as such and let yourself be led by the ceremony master into the dark abyss created before your eyes and allow yourself to be swept into the world of this display.